Ultimate Guide to the Right Phone System | PC.Solutions.Net . : We make nets work! :. 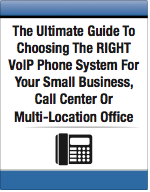 You are about to get the Ultimate Guide to Choosing the Right Phone System. Every business owner, like yourself should read this report before making a decision about phone system. I’m providing this report free of charge for a limited time. You’ll be able to immediately download the report after you submit this form. 7 revealing questions to ask any VoIP salesperson to cut through the hype, half-truths and 'little white lies' they'll tell you to make the sale.